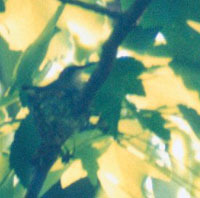 These are two photos of a female Ruby-throated Hummingbird on a nest in Hillsborough River State Park taken by me on March 23, 1999. 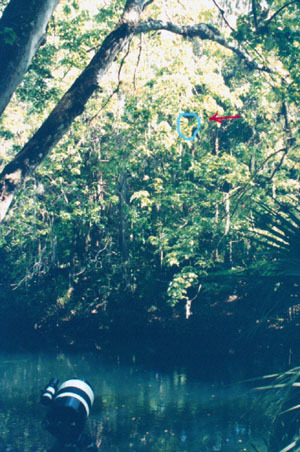 The nest was first reported to Birdbrains by Earl Scales on March 21st. The quality of the original photos was not the best since the nest is in the shade of the leaves and it's a bit too far away for my lens. Although the quality of the originals is better than the scanned images. I'm handholding a 400mm lens. The second photo was taken with a doubler added to the same lens. The photos are mainly to prove that it is a hummer. The link below the second picture will take you to one large photo of the view from the trail, looking out over the river. The nest tree is a Red Maple. I believe it is the only full sized maple that's growing out over the river, between the two rapids. I've marked the approximate placement of the nest. The photo doesn't show the branches as well as I had hoped but I think I found the right placement. I found the nest by first finding a clump of dead leaves. The nest was a bit behind, down, and maybe four feet to the right of the dead leaves. 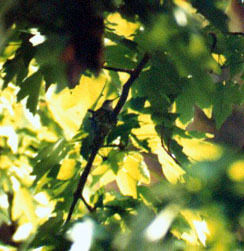 It's very possible that from where ever you stand, the nest will be behind the leaves of a closer branch. By the way, you don't need to be standing "next" to the tree. You can see the nest from the trail. It's a bit slick right next to the tree. I broke my UV filter on my lens and just about busted my bottom when my feet slipped out from under me just as she made her first appearance.